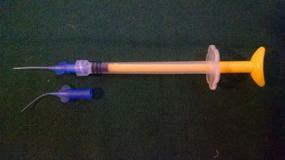 * The syringe tip comes straight, as shown attached to the syringe. It can also be bent, as needed, as the individual tip shows in the image at left. This unique oral irrigating syringe is designed to access an infected periodontal (gum) pocket and deliver a variety of healing solutions that can be helpful in treating gum disease. It has a soft plastic tip that is non-irritating to sensitive teeth and its long tip can extend into even the deepest periodontal pockets. It also can be sterilized and re-used. It is ideal if you have moderate to advanced periodontal disease and can easily be taken with you on trips and vacations. If you do not use a water irrigator I recommend that you use the gum pocket irrigating syringe in areas where the periodontal pocket is deeper than 3mm (about 1/10th of an inch). If you do use a water irrigator I suggest you use the syringe in pockets of 5mm (about 1/8th of an inch) or more, until the infection has been eliminated. Until you are familiar with the directions I recommend you print it so you'll have it handy. Never use excessive force to pull or push the plunger but move it in and out with light but consistent pressure. This will prevent the ring from detaching from the plunger. 1. Prepare the solution you will use in the irrigating syringe. The solution can either be water, hydrogen peroxide (3%), salt water, mouthwash, or a prescription mouthwash from your dentist. 2. With the plunger inserted completely into the syringe, insert the tip of the syringe into the solution and draw the solution into the syringe by slowing pulling up on the syringe handle. Make sure to keep the tip of the syringe in the solution as you pull up on the handle. 3. When the solution has filled the syringe, place the tip of the syringe into the space between the tooth and gum to be irrigated and slowly slide the tip of the syringe down, along the side of the tooth, until it reaches the bottom of the gum (periodontal) pocket. Do not force it, gentle is the key word here. Once you feel the tip touch the bottom of the pocket back lift it slightly and slowly begin to push in on the syringe handle. While pushing in on the handle of the plunger, slowly move the tip of the syringe around the gum pocket in the area around the tooth to be irrigated. Do not push the plunger down too quickly as it will exert too much pressure at the bottom of the infected pocket. 5. When the syringe is empty, refill it and continue irrigating until all of the deeper problem pockets have been irrigated. 6. Irrigate infected areas at least twice a day, unless directed differently by your hygienist or dentist. I believe the best times to irrigate with the syringe are in the morning (after breakfast) and evening (prior to bedtime), but only after you’ve brushed, flossed and used the Water Pik. You can lightly rinse your mouth after you’ve finished irrigating but do not eat for at least 30 minutes. 7. Continue to daily irrigate infected areas until your hygienist or dentist confirms that the infection has been eliminated. The most effective way to determine where to use the irrigating syringe is to get a copy of your gum/periodontal pocket chart from your dental hygienist or dentist. (See page 132 in Healthy Teeth - Healthy Body: How to Improve Your Oral and Overall Health, for a detailed description of how and why periodontal pockets are charted) Briefly, this chart measures the depth of your periodontal pockets, in millimeters, usually in six places around each tooth. (See illustration on page 132 of Healthy Teeth - Healthy Body ). To learn more about Healthy Teeth -Healthy Body, Click Here. The chart’s value to you is as a guide for determining which areas of a tooth will need deeper irrigation than you can get with the toothbrush, floss, or the Water Pik. For example, if you see that in-between two teeth you have pockets of more than 4mm you will know where to use the gum pocket irrigating syringe. Be sure and have your hygienist explain how to read the periodontal chart. It's easy once you know how. It is also a good 'roadmap' to use when brushing, flossing, and irrigating your teeth. The key to using the chart is to spend more time in any area that has a pocket depth of more than 4mm. If you do not see a dentist or dental hygienist on a regular basis, I suggest that you use the oral irrigating syringe in areas where you have bleeding or tender gums. (But remember, using this syringe is not designed to take the place of regular brushing, flossing, using the Water Pik; nor will it replace the need to see a dentist to have a complete dental examination and your teeth cleaned.) If you have any difficulty using the irrigating syringe ask your dental hygienist for help. Do not let anyone else use your gum pocket irrigating syringe. temperature (98.6), no hotter, and try it again. You can keep the syringe clean by wiping the tip of the syringe and the plunger with isopropyl alcohol or hydrogen peroxide. At the end of each use flush the syringe with hydrogen peroxide. You can sterilize the syringe periodically by removing the plunger from the syringe, placing it in a pot, and pouring boiling water over the two pieces. They are made of plastic and will float so push them down under the water for a minute with a fork or other suitable utensil. After cleaning and drying the exterior of the syringe, coat the rubber ring with a thin coat of lubricant, or Vaseline, place it a plastic container and store it in a protected place.